The Arab League (Arabic: الجامعة العربية‎ al-Jāmiʻah al-ʻArabīyah), formally the League of Arab States (Arabic: جامعة الدول العربية‎ Jāmiʿat ad-Duwal al-ʿArabīyah), is a regional organization of Arab states in and around North Africa, the Horn of Africa and Arabia. It was formed in Cairo on 22 March 1945 with six members: Egypt, Iraq, Transjordan (renamed Jordan in 1949), Lebanon, Saudi Arabia, and Syria. Yemen joined as a member on 5 May 1945. Currently, the League has 22 members, but Syria's participation has been suspended since November 2011, as a consequence of government repression during the Syrian Civil War. Through institutions, such as the Arab League Educational, Cultural and Scientific Organization (ALECSO) and the Economic and Social Council of the Arab League's Council of Arab Economic Unity (CAEU), the Arab League facilitates political, economic, cultural, scientific, and social programmes designed to promote the interests of the Arab world. It has served as a forum for the member states to coordinate their policy positions, to deliberate on matters of common concern, to settle some Arab disputes and to limit conflicts such as the 1958 Lebanon crisis. The League has served as a platform for the drafting and conclusion of many landmark documents promoting economic integration. One example is the Joint Arab Economic Action Charter, which outlines the principles for economic activities in the region. In the early 1970s, the Economic Council of the League of Arab States put forward a proposal to create the Joint Arab Chambers of Commerce across the European states. That led, under the decree of the League of Arab States no. K1175/D52/G, to the decision by the Arab governments to set up the Arab British Chamber of Commerce which was mandated to "promote, encourage and facilitate bilateral trade" between the Arab world and its major trading partner, the United Kingdom. The Arab League member states cover over 13,000,000 km2 (5,000,000 sq mi) and straddles two continents: Africa and Asia. The area largely consists of arid deserts, such as the Sahara. Nevertheless, it also contains several highly fertile lands like the Nile Valley, the Jubba Valley and Shebelle Valley in the Horn of Africa, the Atlas Mountains in the Maghreb, and the Fertile Crescent that stretches over Mesopotamia and the Levant. The area comprises deep forests in southern Arabia and parts of the world's longest river, the Nile. The Charter of the Arab League, also known as the Pact of the League of Arab States, is the founding treaty of the Arab League. Adopted in 1945, it stipulates that "the League of Arab States shall be composed of the independent Arab States that have signed this Pact." Syria was suspended on 16 November 2011. On 6 March 2013, the Arab League gave the Syrian National Coalition Syria's seat in the Arab League. On 9 March 2014, secretary general Nabil al-Arabi said that Syria's seat would remain vacant until the opposition completes the formation of its institutions. At the Beirut Summit on 28 March 2002, the league adopted the Arab Peace Initiative, a Saudi-inspired peace plan for the Arab–Israeli conflict. The initiative offered full normalisation of the relations with Israel. In exchange, Israel was required to withdraw from all occupied territories, including the Golan Heights, to recognise Palestinian independence in the West Bank and Gaza Strip, with East Jerusalem as its capital, as well as a "just solution" for the Palestinian refugees. The Peace Initiative was again endorsed at 2007 in the Riyadh Summit. In July 2007, the Arab League sent a mission, consisting of the Jordanian and Egyptian foreign ministers, to Israel to promote the initiative. Following Venezuela's move to expel Israeli diplomats amid the 2008–2009 Israel–Gaza conflict, Kuwaiti member of parliament Waleed Al-Tabtabaie proposed moving Arab League headquarters to Caracas, Venezuela. On 13 June 2010, Amr Mohammed Moussa, Secretary-General of the Arab League, visited the Gaza Strip, the first visit by an official of the Arab League since Hamas' armed takeover in 2007. The Arab League also includes great fertile lands in the southern part of Sudan. It is referred to as the food basket of the Arab World, the region's instability including the independence of South Sudan has not affected its tourism industry, that is considered the fastest growing industry in the region, with Egypt, UAE, Lebanon, Tunisia, and Jordan leading the way. Another industry that is growing steadily in the Arab League is telecommunications. Economical achievements within members have been low in the league's history, other smaller Arab Organizations have achieved more than the league has, such as the GCC, but lately several major economic projects that are promising are to be completed, the Arab Gas Pipeline is to end by the year 2010, Connecting Egyptian and Iraqi Gas to Jordan, Syria and Lebanon, and then to Turkey thus Europe, a free trade Agreement (GAFTA) is to be completed by 1 January 2008, making 95% of all Arab Products tax free of customs. The Arab League is divided into five parts when it comes to transport, with the Arabian Peninsula and the Near East being entirely connected by air, sea, roads and railways. Another part of the League is the Nile Valley, made up of Egypt and Sudan. These two member states have started to improve the River Nile's navigation system to improve accessibility and thus foster trading. A new railway system is also set to connect the southern Egyptian city of Abu Simbel with the northern Sudanese city of Wadi Halfa and then to Khartoum and Port Sudan. The third division of the League is the Maghreb, where a 3,000 km stretch of railway runs from the southern cities of Morocco to Tripoli in Western Libya. The fourth division of the League is the Horn of Africa, whose member states include Djibouti and Somalia. These two Arab League states are separated by only ten nautical miles from the Arabian Peninsula by the Bab el Mandeb and this is quickly changing as Tarik bin Laden, the brother of Osama bin Laden, has initiated the construction of the ambitious Bridge of the Horns project, which ultimately aims to connect the Horn of Africa with the Arabian Peninsula via a massive bridge. The project is intended to facilitate and accelerate the already centuries-old trade and commerce between the two regions. The last division of the League is the isolated island of Comoros, which is not physically connected to any other Arab state, but still trades with other League members. The Arab League is a culturally and ethnically one association of 22 member states, with the overwhelming majority of the League's population identified as Arab (on a cultural ethnoracial basis). 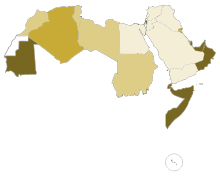 As of July 1, 2013, about 359 million people live in the states of the Arab League. Its population grows faster than in most other global regions. The most populous member state is Egypt, with a population of about 91 million. The least populated is the Comoros, with over 0.6 million inhabitants. Almost all of the Arab League's citizens adhere to Islam, with Christianity being the second largest religion. At least 15 million Christians combined live in Egypt, Iraq, Jordan, Lebanon, Palestine, Sudan and Syria. In addition, there are smaller but significant numbers of Druze, Yazidis, Shabaks and Mandaeans. Numbers for nonreligious Arabs are generally not available, but research by the Pew Forum suggests around 1% of people in the MENA region are "unaffiliated". ^ Sly, Liz (12 November 2011). "Syria suspended from Arab League". Washington Post. ^ a b c "Pact of the League of Arab States, 22 March 1945". The Avalon Project. Yale Law School. 1998. Archived from the original on 25 July 2008. Retrieved 15 July 2012. ^ "The Arab League Educational, Cultural and Scientific Organization (ALESCO)". ^ Fanack. "The Joint Arab Force—Will It Ever Work?". Fanack.com. Archived from the original on 13 July 2015. Retrieved 13 July 2015. ^ Avi Shlaim, Collusion Across the Jordan: King Abdullah, the Zionist Movement and the Partition of Palestine. Oxford, U.K., Clarendon Press, 1988; Uri Bar-Joseph, Uri, The Best of Enemies: Israel and Transjordan in the War of 1948. London, Frank Cass, 1987; Joseph Nevo, King Abdullah and Palestine: A Territorial Ambition (London: Macmillan Press; New York: St. Martin's Press, 1996. ^ "Pact of the League of Arab States, March 22, 1945". Yale Law School. Retrieved 9 July 2016 – via law.yale.edu. ^ "Arab League Fast Facts". CNN.com. 30 July 2013. ^ "Libya suspended from Arab League sessions". Ynetnews.com. 20 June 1995. Retrieved 28 April 2014. ^ "Arab League Recognizes Libyan Rebel Council". RTT News. 25 August 2011. Archived from the original on 8 December 2011. Retrieved 25 August 2011. ^ Black, Ian. "Syrian opposition takes Arab League seat". The Guardian. Retrieved 20 November 2014. ^ "Syria opposition 'not yet ready for Arab League seat'". The Daily Star Newspaper. Lebanon. Retrieved 20 November 2014. ^ "Internal Regulations of the Council of the League of Arab States". Model League of Arab States. Ed Haynes, Winthrop University. 6 April 1998. Archived from the original on 6 April 2008. Retrieved 9 July 2008. ^ "Internal Regulations of the Committees of the League of Arab States". Model League of Arab States. Ed Haynes, Winthrop University. 6 April 1998. Archived from the original on 6 April 2008. Retrieved 9 July 2008. ^ "Internal Regulations of the Secretariat-General of the League". Model League of Arab States. Ed Haynes, Winthrop University. 6 April 1998. Archived from the original on 6 April 2008. Retrieved 9 July 2008. ^ Council of Arab States (1 October 2005). "The Arab Peace Initiative, 2002". al bab. Archived from the original on 4 June 2009. Retrieved 9 July 2008. ^ "Kuwaiti MP calls to move Arab league to Venezuela". AFP, via CaribbeanNetNews. 15 January 2009. Archived from the original on 4 March 2009. Retrieved 16 January 2009. ^ Boyle, Christina; al-Alayaa, Zaid (29 March 2015). "Arab League's joint military force is a 'defining moment' for region". Los Angeles Times. ^ "Turkey slams Arab League resolution on Afrin operation". Yeni Safak. 18 April 2018. ^ "الأردن يستضيف القمة العربية في مارس". www.alarabiya.net. ^ "Arab-Israeli Wars: 60 Years of Conflict". ABC-CLIO. Retrieved 30 June 2014. ^ Osmańczyk, Edmund Jan (2003). 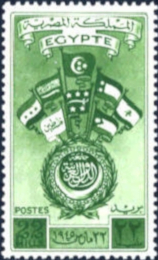 "League of Arab States". In Mango, Anthony (ed.). Encyclopedia of the United Nations and international agreements. 2 (3 ed.). New York: Routledge. p. 1290. ^ "Arab summit agrees on unified military force for crises". Reuters. 29 March 2015. ^ "Reuters.com". Reuters. Retrieved 20 November 2014. ^ "Family Ties: Remittances and Livelihoods Support in Puntland and Somaliland" (PDF). FSNAU. Retrieved 11 December 2016. ^ "Central Agency for Public Mobilization And Statistics". Archived from the original on 26 April 2011. ^ a b c d e f g h i j k l m n o "World Population Prospects, Table A.1" (PDF). 2008 revision. United Nations Department of Economic and Social Affairs. 2009: 17. Retrieved 22 September 2010. ^ "Site institutionnel du Haut-Commissariat au Plan du Royaume du Maroc". Site institutionnel du Haut-Commissariat au Plan du Royaume du Maroc. ^ "الجهاز المركزي للإحصاء". www.cbs.gov.sd. ^ "National Statistics Institute of Tunisia". Archived from the original on 4 September 2015. Retrieved 20 November 2014. ^ "المركز الوطني للإحصاء: المواطنون 947.9 ألفاً - جريدة الاتحاد". Alittihad.ae. Archived from the original on 19 July 2011. Retrieved 16 August 2011. ^ Bahraini Census 2010 - تعداد السكــان العام للبحريــن 2010 Archived 20 March 2012 at the Wayback Machine. Census2010.gov.bh. Retrieved on 2014-04-28. Wikimedia Commons has media related to League of Arab States. "Arab League collected news and commentary". The New York Times. This page was last edited on 1 March 2019, at 09:29 (UTC).